More and more restaurants are realizing that the trend towards vegan cusine and plant-based meals are on the rise – even in smaller cities, like the one I live in! These chefs and restaurant owners are following the times, serving up healthy and delicious plant-strong vegan food! Here’s a look at what a friend of mine and I had for lunch yesterday! It’s mouthwatering for sure! As Dr. Neal Barnard will sometimes say, “This sure isn’t suffering!” I just love that line! 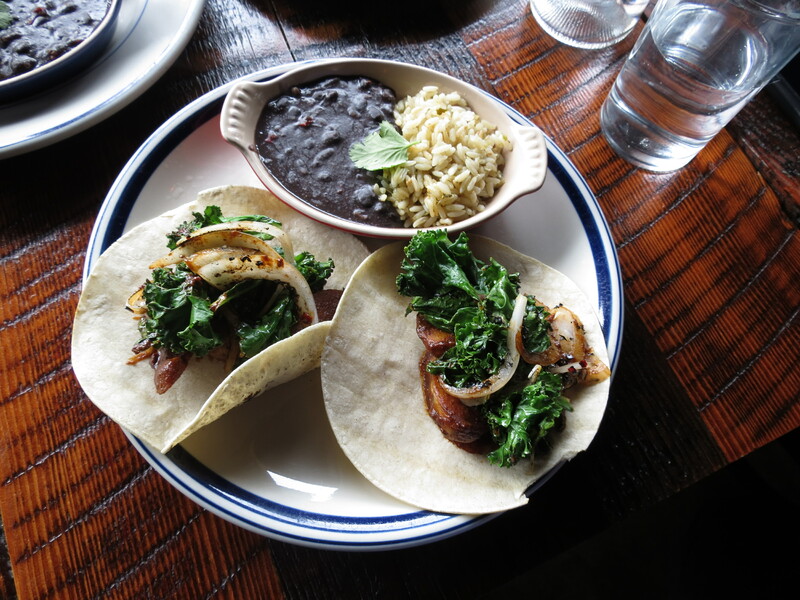 The Charred Kale & Potato Taco is one of my favorites. It has spiced & charred kale, fingerling potatoes, charred onions & mole. Very Yummy! Normally, this would come with cheese, but I just asked for it to be kept off! We also had Brussel & Apple Tacos. 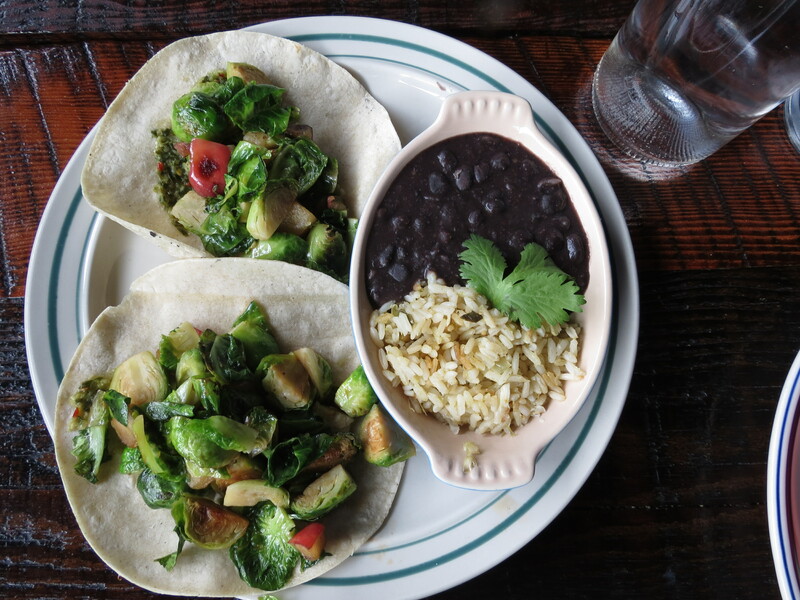 The Brussels & Apple Tacos have diced apples, seasoned in white wine and chimichurry. The final dish that we tried was the Mushroom Taco. Isn’t it pretty? 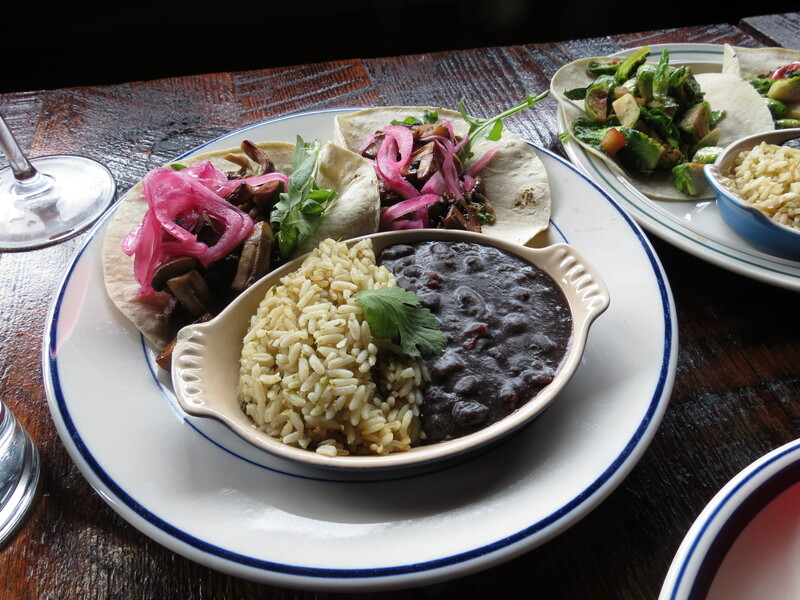 The Mushroom Taco is made with seasonal, locally foraged mushrooms, pickled red onions and greens! Very delicious and nutritious as well! Now could these be made in your own kitchen? Absolutely! But sometimes it’s just fun to go out and have someone else cook up delicious & tasty meals for you! I spoke to the chef and co-owner of this restaurant and learned that he’s a big fan of Gracias Madre in San Francisco. I can see where he got his inspiration, but I would say that these are just as fantastic – if not better! I appreciate that he’s sticking more to the plants and less to the processed! What have you had that was fabulous and noteworthy?